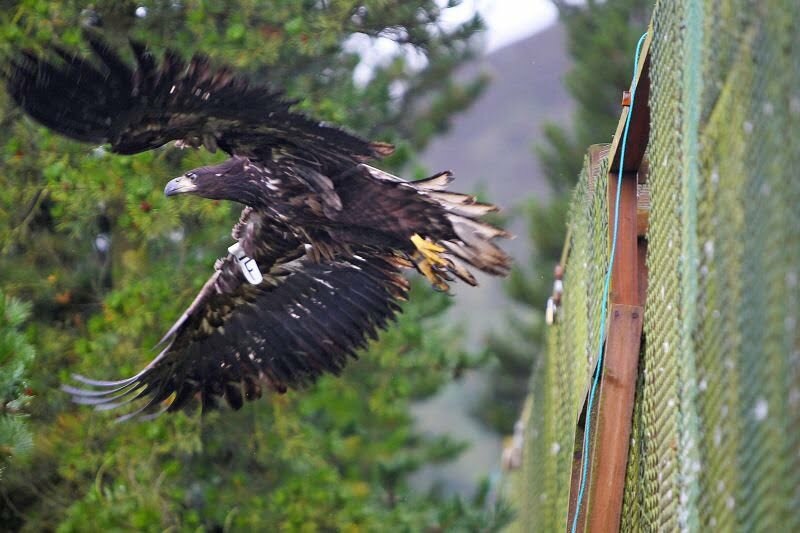 Determined not to be thwarted by the spate of illegal poisonings, the Golden Eagle Trust has released ten new white tailed eagles into the skies of County Kerry as part of their on going re-introduction for this iconic bird of prey. The new birds, all between 10 and 14 weeks old, come from a batch of 23 chicks donated to the Kerry project by Norwegian wildlife authorities earlier this year. Over the last five years 100 white tailed eagles have been reintroduced to Co. Kerry as part of this ambitious programme. Not without its setbacks, the project has lost a total of 19 birds over recent years, with a spate of confirmed poisonings claiming the lives of ten eagles another five suspected poisonings and at least two birds falling victim to unfortunate collisions with wind turbines. Project co-ordinator Dr Allan Mee said that last week’s release marked a “very important milestone” that would help everybody involved in the project to regroup after the unfortunate set-backs. “We’ve taken a very heavy hit but with the decision to impose a ban on the type of poisons involved we’re looking to a better future and we hope it will make a difference," said Dr Mee. "We are also involved in an information campaign to inform the public of the advantages of the project but it’s going to take time. "We are confident that when the issue of poisoning has been properly tackled, there will be nothing to inhibit the eagle population from growing successfully as some of the first birds released in 2007 are now reaching maturity." As with previous birds the 10 eagles released today will be fitted with special radio transmitters that allow the team to monitor their movements. "We are monitoring many of the eagles we released already and they seem to be doing fine. In summertime they are dispersed all over the place and we have been tracking some of those set free in Killarney who are now frequenting places like Donegal, Connemara and even Scotland," said Dr Mee. "They are using the whole island and it is a very exciting time for all of us involved in the project."